Rats and mice are omnivores. Domesticated ones typically live on standard pellet mixes balanced for specific species nutritional needs, but ration is not the only way to go. Pet rats and mice will thrive on organic diets that take into account the creatures' natures and nutritional needs. Take control of your rat or mouse's diet by feeding an organic diet -- a diet with ingredients grown with animal or vegetable fertilizers only, never chemicals or pesticides. Commercial lab blocks are formulated with the proper nutrition for rats and mice. At the time of publication, certified organic commercial varieties were nonexistent. Commercial seed mixes may be all-natural but not certified organic. To ensure the seed you feed your rat or mouse is entirely organic, you'd have to create your own using organic seeds. Seed mixes, though, should be fed sparingly -- as treats only -- as they contain too much fat for rats and mice as as a diet. 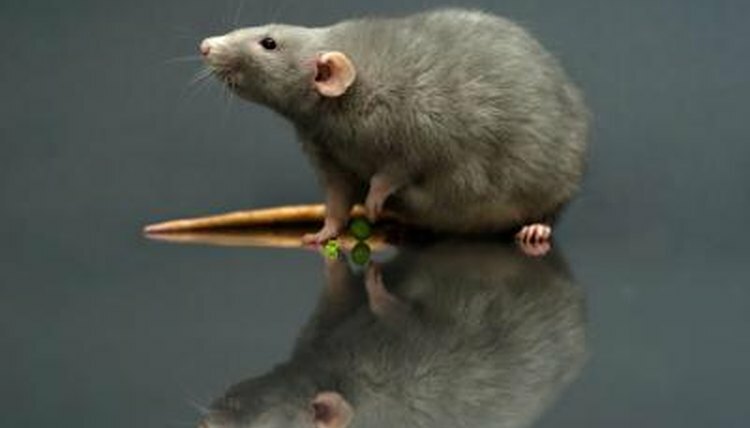 Perhaps the best option for an all-organic rat and mice diet is one crafted at home from organic whole-grain pastas, seeds, vegetables and protein sources. Begin with a base of grains, such as organic uncooked whole wheat pasta, organic puffed wheat and sugarless cereals, wheat germ, or toasted bread. Add a protein source such as an organic dog food, a small amount of uncooked or cooked organic hamburger, a small cube of liver, or eggs. Then add, with variety, fresh fruits and veggies. Experiment with organic kale, avocado, broccoli, peas, mango, cooked sweet potatoes, carrots or grapes. Try new ingredients in small quantities first, to rule out any potential for allergies in your rat or mouse. Some fruits, seeds and other organic items are suitable for rats and mice to consume only in moderation. These include organic versions of yogurt, cheeses, raisins, popcorn and dog biscuits. Organic sunflower seeds are great as treats but not as a diet staple as they are fatty and lack nutrition. Organic peanut butter is also a good treat that can entertain young family members as they watch your rat or mouse attempt to lick it all up. When making any organic food mix at home, confirm the appropriateness of every ingredient you add. If you're unsure of a substance, check with your vet. Otherwise, it is better to not feed it to your rat or mouse. Foods -- including organic ones -- that are toxic to rats and mice include citrus, blue cheese, licorice, oranges, chocolate, bitter almonds, raw onion and raw brussels sprouts.